This past Friday Ghana honored its late, great leader Kwame Nkrumah with its annual national holiday, Founder’s Day. Here’s to the father of the independent Ghanaian state – Happy Birthday Kwame! When looking at statistics or numbers in development, it’s so easy to forget that there are people behind those numbers. And the villages in which CWS has implemented are no different. They are inevitably made up of people. 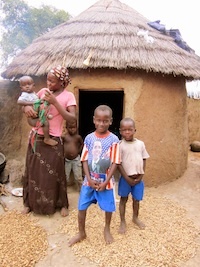 They have their own personalities, stories, families, livelihoods, conflicts, drama, laughter, hopes and dreams…. The same goes for the women (and man – shout out to the infamous Alhassan, the man who runs the water treatment center in Jerigu) of the CWS water enterprises. They have their own ways of doing business, staying organized, dealing with set backs and choosing how they spend their profits. These water treatment centers are businesses after all. So there’s no reason to think that they’d operate any differently than let’s say a food stand in the market or even a small business back in Boston. Business is business no matter where you are or what you’re selling in the world: acquire capital, acquire goods, sell goods, make a profit and buy more capital…Most importantly modify the business based on your situation and work habits to make it the most efficient it can be. The CWS business method is pretty straightforward and uniform throughout the villages in which we implement in and around the Tamale Metropolis. To give you a very brief overview for those of you that are not overly familiar with our approach: CWS finds a village that drinks fecally contaminated surface water (aka dugout water), fellows fundraise and come to Ghana to provide the hardware and to implement the water treatment center in the village, fellows train two women to treat the water with low-cost chemicals and to sell the water back to the community at an affordable price. Then, the CWS field staff monitor and supply the women with aquatabs for five years post-implementation. Every CWS partnership community is given the capital to start their water business, which includes a polytank, polytank stand, at least 3 blue drums, alum, aquatabs and finally every household in these villages is given a safe storage container to store the water that they buy. So if implementation is the same throughout, then what, might you ask, could really make every CWS enterprise unique? The answer is quite simply the people. This past week, in the village of Jagberin, Aisha closed the water treatment because the lock to the polytank broke. She was leaving treated water stored in the polytank overnight and would wake up to find that water was missing! The water level was significantly lower than she had left it the night before. After some investigation, she discovered that farmers from Jagberin had realized the polytank was unlocked and came early in the morning to fill their garrawas with stolen water. Aisha decided to close her business until she could buy a new lock because she did not want to risk losing money. 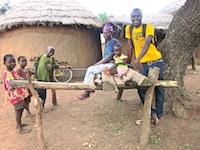 Wahab and I went to Jagberin this Tuesday to do household visits and realized what was going on. This is a sticky situation because while these water treatment centers are businesses, their main function is provide people with clean water. After talking to Aisha, she agreed to fill the polytank with one blue drum at a time until she bought a new lock. She is going to make announcements for when she is going to sell with the hopes of selling all of the water at once so that none is left in the polytank for people to steal. As of today, she has a new lock! Kadula is a village that got off to a rocky start. At first there was one woman, Abiba, who was running the water treatment center; however, business did not go well. Apparently there was widespread belief in the community that this woman was a witch. So no one would buy water from her. CWS intervened and held a meeting with the elders to elect new women to run the water business. 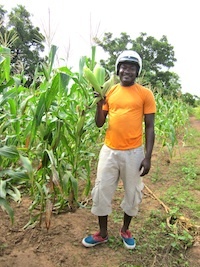 Kadula is one of the bigger CWS communities with over 100 households. The elders of Kadula decided to elect 15 women (5 women from the 3 “neighborhoods” of Kadula) to work in a rotation of filling the blue drums. They elected Azaratu as the leader of these women, to oversee and run the business. 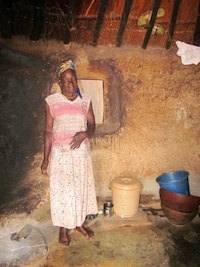 Azaratu collects the money, buys aquatabs and makes all major decisions for the water treatment center. In Kpalung, the polytank stand was initially built next to the dugout, which a very far walk from the village center. There were many complaints that the center was too far. Also, during the rainy season, the dugout becomes obsolete because everyone harvests rainwater to avoid the long trek to fetch water. Solution? After much discussion with Azaratu and the elders, they decided to move their water treatment center to town. During the dry season, Azaratu pays a donkey businessman to cart water from the dugout to the water treatment center and in the rainy season, she harvests rainwater with the blue drums to treat. While this seemed to be working, there were a few complications. The donkey businessman was charging Azaratu 60 pesawas, the equivalent of two aquatabs or the equivalent of selling 6 20 L buckets of water, to fill every blue drum. She was no longer making a substantial return to her investment. CWS field staff decided to hold a village meeting between Azaratu, the chairman and the donkey businessman to agree upon a fair price. For now, the donkey businessman is no longer charging Azaratu for his services and in exchange gets to fill his safe storage container for free at the water treatment center! The last story that took place in Kpalung was one of the first village meetings that I oversaw as Ghana Country Director of CWS. I realized early on that the problems I would encounter with the CWS water businesses were not as black and white as I thought they would be when I was a fellow. People will always be people and sometimes life gets in the way but that just makes it all the more interesting for us in Tamale. Its that time of year again, CWS is hitting the road to recruit for our Fellowship Program! Our Fall Recruitment schedule is starting to come together, so check it out, see if we’ll be at a school or city near you, and then come on out to an info session to learn more about the Fellowship! Don’t see your school/city on the list? Send us a note and request presentation. We’d be happy to come to your area! George Washington University: Tuesday, September 18th at 3pm in Ross Hall Lobby C.
Great new article about CWS on BostonInnovation.com today! Check it out! Thanks BostonInno for helping spread the word about our work! With the recent tragic passing of President John Atta Mills and the December elections approaching, the Ghanaian government has been making international news headlines. What you don’t hear as much about are the local government institutions that keep the country running. This blog post is about those officials, plauges (?*!? 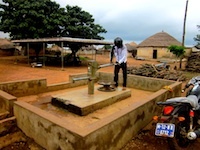 Keep reading…) and offices that help Community Water Solutions do its work in the Northern Region. NDC supporters turn out to welcome the new President. This is a sneak preview of the support for the National Parliamentary and Presidential elections coming up in December! Wait, wait, I’m getting ahead of myself already. Northern Region is a region, like an American state or a Canadian province, in (you guessed it!) the north of Ghana. Actually, its not Ghana’s nortmost region; that distinction is held jointly by Upper East and Upper West Regions, but more about them on a later day. Tamale is the largest city in Northern Region. It’s where our fellows sleep, where our office is located, and where we purchase many of our business supplies. Northern Region is further divided into districts, which are governed by elected District Assemblies. The signboards that fellows see around town, “Iddrisu Haruna, Lawyer, for Tamale North Constituency”, are campaign tools for the December District Assembly elections. Each district also has a building that houses the offices for public works. Environmental Health is the department that I am most interested in, as water comes into play here. Most districts have a Water and Sanitation Team that deal with their constituency’s difficulties in these areas. This plague marks the Municipal Assembly in Bawku, Upper East. On top of the challenges faced by district officials, public service can also be a hazardous occupation! If each district has a team devoted to dealing with its local water problems, where and why does CWS come into play? The answer is complicated. Part of the answer has to do with boreholes. Many governments, NGOs and private citizens the world over think that boreholes are the silver bullet to the water crisis. 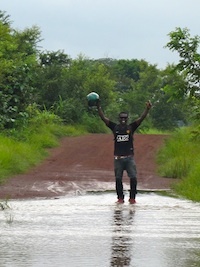 It certainly is the standard approach to water access in communities here. Boreholes and other groundwater access can be a great solution – they can cut down on time hauling water and they don’t have most of the contamination problems that traditional surface water sources have. However, boreholes can be problematic in many places. In large areas of Northern Region, for example, groundwater is extremely difficult to access, and borehole success rates are as low as 20%. Boreholes and pumps are neither cheap nor intuitive to fix and currently a huge proportion across sub-Saharan Africa are in disrepair. Lastly, they are comparatively expensive to drill. Which introduces the next challenge faced by the District Assemblies: funding. The majority of district funding for water projects does not come from Ghanaian tax dollars. It comes from national or regional donations from multinational organizations and NGOS like UNICEF or the EU. This means that yearly funding is tied to donor priorities, which can be tricky. For example, since Ghana is on track to meet the Millennium Development Goals for water, district budgets for water projects are getting axed. It also means that one-time expense projects, like boreholes, where you can cut a ribbon, snap pictures, check a box and drive home are more likely to get funded than longer-term needs (like monitoring). Between borehole mania and funding difficulties, it has been challenging for districts to come up with alternative solutions local water problems, but that’s where we come in! The boxes are labeled “National Archives.” Wonder which folder is the borehole report I was looking for? Of course, different district bureaucracies function at different levels of efficiencies. Some districts or teams are able to stay on top of their game even in the face of these challenges. Some, uh, aren’t. CWS is a lean, mean water-treating machine, and we are able to pick up the slack when local institutions just don’t have the capacity to meet all their constituency’s basic needs. Challenges aside, without the help of district officials, CWS’ would not have been able to expand as quickly or effectively as we have. In turn, we are able to compliment local government efforts with our unique and flexible approach to the water problem here. It’s a partnership we hope to continue well into our future! For more information about the upcoming elections, check out Ghana Decides, a really cool local NGO that is using all sorts of social media to keep Ghanaians updated about the election! The Community Water Solutions’ Second Annual Benefit was a huge success! Thanks to the support of our amazing event committee (Sarah, Mike, Sarah, Nick, Christine, Vanessa, and Marc), generous event sponsors, Foley Hoag, Goodwin Proctor & Wolf Greenfield, and, of course, everyone who attended the Benefit, we were able to raise a total of $21,791 – exceeding our goal of $20,000 and more than doubling the amount raised at last year’s event! The night ran as smoothly as possible. The ambiance of the W Hotel combined with the music provided by jazz guitarist, Scott Free, resulted in a beautiful evening that was enjoyed by all! April Obey from April K Photography generously donated her time and talent by setting up a photobooth where attendees took picture with the CWS blue safe storage containers. Check out the photos below! The night also included a celebration of the launch of our new website! Thanks to the talent and enthusiasm of the Cloud Construct Team— specifically Rebecca, Arra & Kate – we are so excited and proud to introduce our new site! Cheers to our event sponsors, event committee, beverage sponsors and all who could join us in the evening! We cannot wait for next year!